If you’re someone who loves riding your bicycle outside, live in an area that has unpredictable weather, want the company of other people around you, and you want to ride in a way that will burn more calories than you currently do, you should really think about signing up for an indoor cycling class. There are thousands of people who find it to be a lot of fun. In order to make sure that you are able to get the most of your very first session, it’s important that you are aware of certain things that you should (and shouldn’t do). 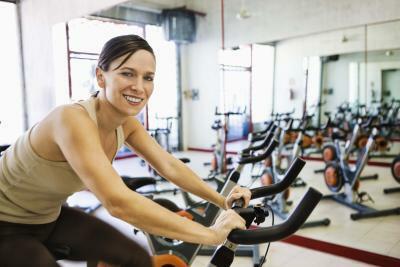 Here are five tips to help you to maximize the benefits of your indoor cycling class. Eat first. Being that spinning class is a high-energy kind of workout, it’s important that you don’t go on an empty stomach. Now, this doesn’t mean that you should have an eight-course meal first; just that you shouldn’t feel hungry. Some fresh fruit, carrot slices or even a smoothie should do the trick. Also, it’s important to take a water bottle with you. If you are taking full advantage of the course, you’ll be sweating a lot. You’ll need to replenish yourself. Go with a friend. Although spinning class is something that tends to have a lot of people in it, if you want to spend some quality time with a friend or you simply want to go with someone who will push you to do your best, take a friend along with you. There are actually a lot of spinning teachers that recommend that you do. Don’t hunch your shoulders. Once you’re actually up on your bicycle, there might be a temptation to hunch over your shoulders. Try and avoid doing so at all costs, though. By putting your shoulders into more of a relaxed position instead, you are then able to engage your abdominal core. Plus, that makes it easier to keep your feet flat on the pedals so that you can move at a much more consistent pace. Engage your core. If you were to go to a place like Empower Cycling Studio for spin class, one of the things that your instructor would probably recommend is that you put forth the effort to actually engage your core. You can do this by imagining that you have a girdle on as you’re riding the bicycle. Remember, the handles on the bicycle are not there to hold you up. They are there to help you to keep your balance. It’s your abdominal muscles that should be doing a significant amount of work. Listen to your instructor. Although spinning class is designed for you to move at your own pace, this doesn’t mean that you shouldn’t listen to your instructor. The speed is basically up to you but when it comes to everything else, it’s a good idea to pay attention to what the teacher is saying. They are skilled in spinning and can help you to get the most out of each and every workout. Have fun! For more visit http://pearsonstyle.com/.